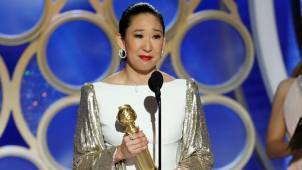 In the immediate aftermath of Sandra Oh’s Golden Globe co-hosting stint/Lead Actress victory last week, Grey’s Anatomy star Kevin McKidd didn’t just shower his former leading lady with congratulations on social media. He brought the message to the Killing Eve star in person. McKidd has maintained a tight relationship with Oh since the actress departed Grey’s four years ago. What’s the secret behind their enduring bond? “We really trust each other and know each other,” he says. “During all of those hours working together [on Grey’s] we watched each others’ lives unfold… When she was going through a hard time, or I was, [we] leaned on each other. Grey’s Anatomy kicks off the second half of Season 15 this Thursday (8/7c, ABC).